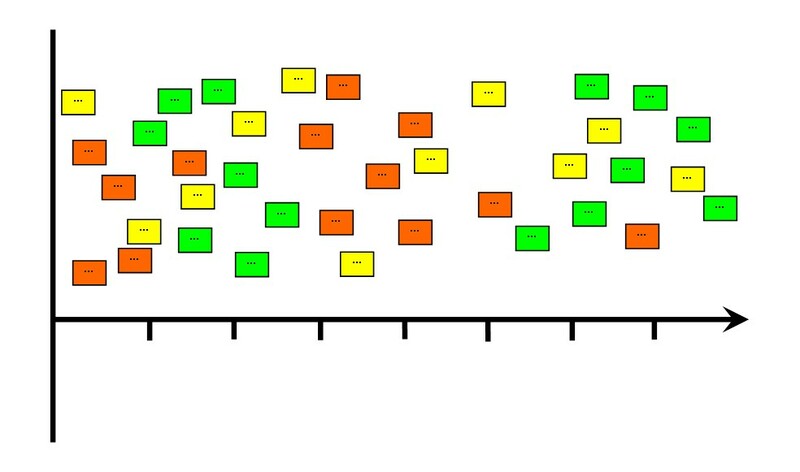 The retrospective timeline is a useful exercise for gaining a better understanding and a richer context for a particular retrospective. 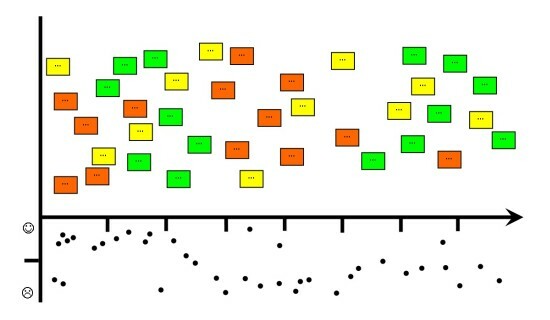 This means that this exercise becomes less useful when you do retrospectives more frequently and especially useful when doing a retrospective spanning longer periods or you run retrospectives less frequently. The timeline aims to give a very visual overview of the events that occurred during the period for which you are doing the retrospective. 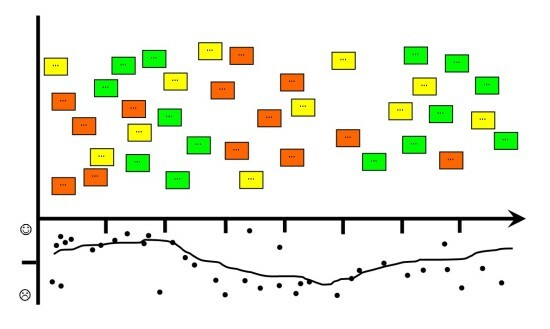 The facilitator should use distinct and bold colours to identify distinct events so that it is easier to interpret the results. 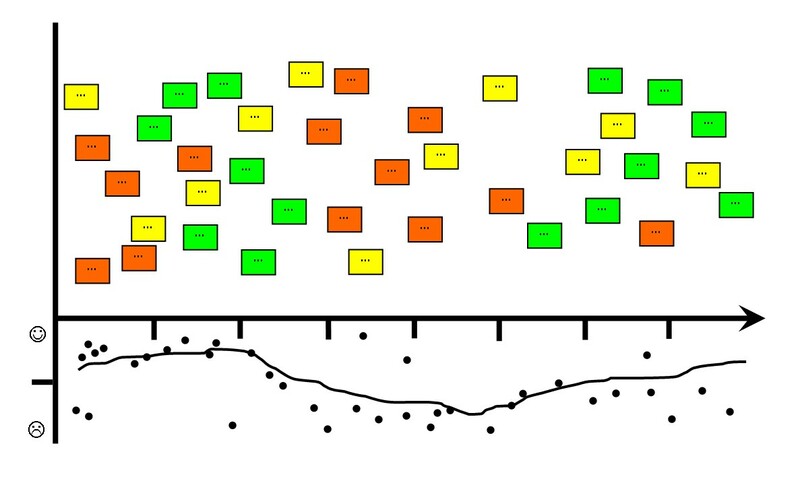 The timeline is a great way of determining trends over time for periods in the project and a useful mechanism for getting a feel for how the team felt throughout the course of the project. The types of events that you might want to consider suggesting include things like when people rolled on or off projects, when things kicked off, when someone in the business made a decision that affected the team in a great way, when the team did achieved something really amazing, etc. It is a good idea for you to get everyone to explain events, especially if the participants may not have full knowledge of what was going on. The significant events help to put things into context and might answer a few of the puzzling questions some people might have about the project, and the good points help to identify strengths while the problematic points should lead you to discussing action items. 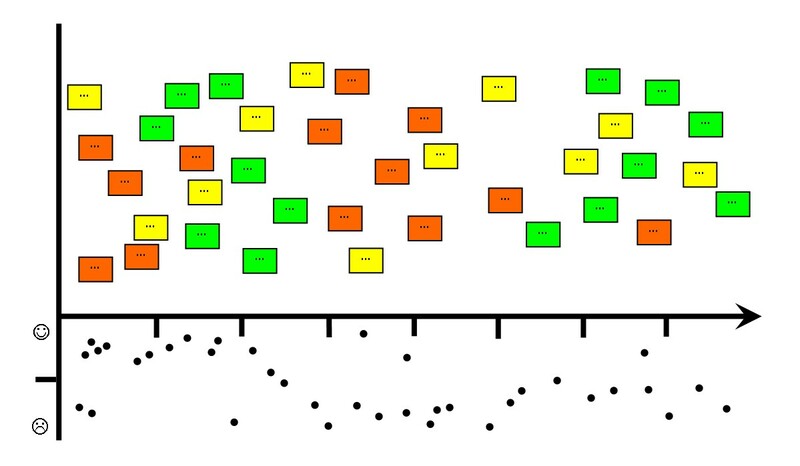 I find this exercise is most useful for first putting context for a retrospective spanning a large time and then using other exercises to draw out further conclusions. It is a good mechanism just to get the discussions flowing within the team and allows the facilitator to try to put different perspectives on things. The visual nature of the timeline allows you to easily draw out a number of trends from the project. Large concentrations of a particular colour may attract your attention to a certain period and it would be worthwhile trying to pinpoint its underlying cause so you can attempt to replicate (or avoid) the same circumstances in the future. The general trend at the bottom may or may not coincide with the events above the line so there might be another discussion point for explaining why morale might be low even though there might be lots of green or why it is high even though there were problematic events (maybe it was a good team building experience or people were growing and learning). Thank you for including the graphs and making the information easily digestable. I definitely have taken what you explained here into account and will remember it when designing our next team building experience. Thanks Pat. I needed a refresher on the timeline retro today as I head in to facilitate a large session. You’re the best (miss you)! Thnx, the best timeline explanation till now.